Thread: This is going to leave a mark. There I was, just riding along, heading toward work on my fixie; I have done this 4 times a week for the last 5 years, then bam. I hit a pot hole to end all pot holes. Of course it was halfway down the only real hill. I managed to control the fall enough that I didn't go over the bars. I slide on my right side under the bike. The impact was about the worse pain I have ever felt. The first X-rays could not find any broken ribs, but I know what broken ribs feel like and I have one. 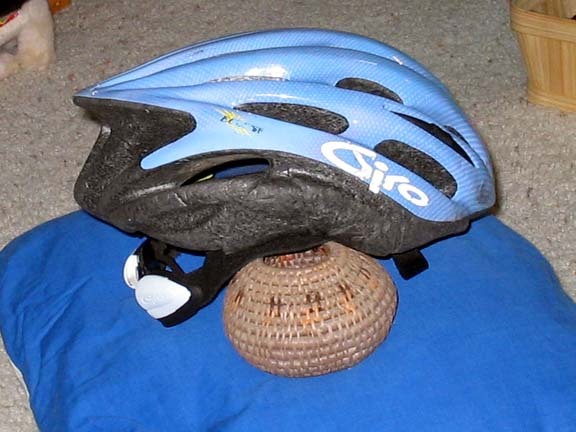 Other than that I have to thank Giro for saving my head. The right portion of the helmet was crushed. Guys, I see alot of fixie riders not wearing helmets. Please do so. God is good' all the time. All the time; god is good. My glasses caused a 1" laceration above my eyebrow. There is also road rash on my right shoulder and knee. Glad it wasn't any worse How's the bike? I haven't seen the bike since.. I vaguely remember the bike wasn't to bad. 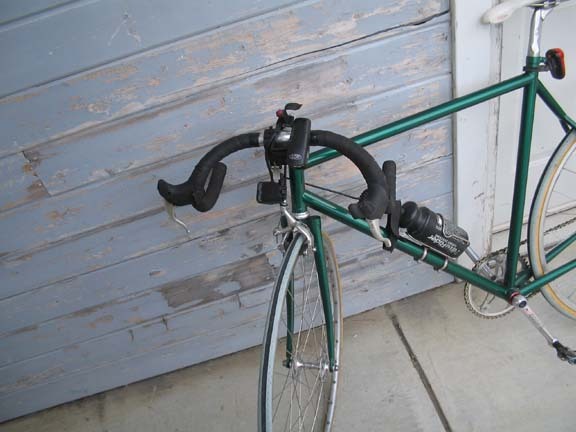 The handlebars were twisted forward and the right brake lever was tweaked around. My buddies at the Police Station have it waiting for me there. Hopefully I'll feel better and will be able to pick it up tomorrow. The robe was a fortuitis birthday present; at the moment I can't raise my right arm high enough to put on a shirt. Last edited by aka brad; 02-17-2007 at 10:21 PM. keep the blood and gut's on the inside! It's bound to happen sooner or later huh. hope your on the bike soon. I like the robe too! Glad to hear you aren't hurt too bad. Giro saves another one. Good think us elders know to wear the dome. It might seem bad right now, however the face heals remarkably well. Back in my bmx days I met the pavement at speed with my face (bad jump at night). Long story short, it took a lot of skin off my cheek by my eye. It was about the diameter of a tennis ball. Anyway, today you can't tell it ever even happened. It is likely after some time that it would be hardly noticeable at all. 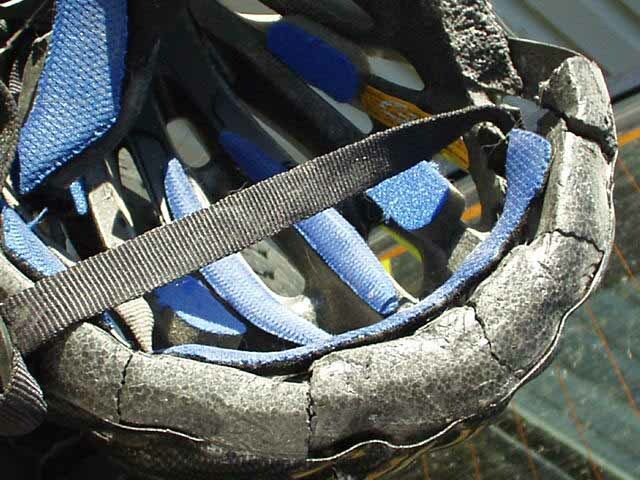 Its good to hear the helmet took the worst of it while saving your cranium. 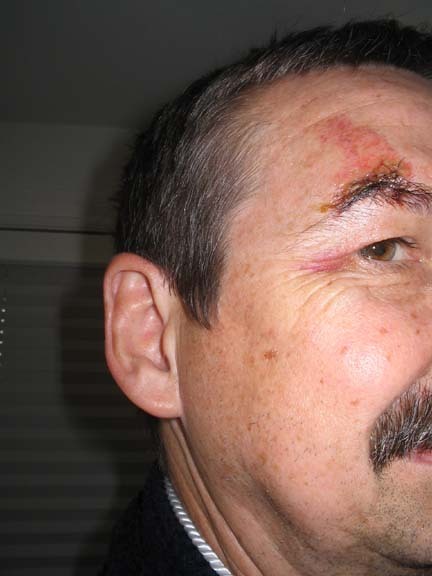 The worst faceplant in the concrete I ever saw happened to a friend of my Dad's. He talked my Dad into pulling him on his dirt bike with a rope tied to my Dad's truck to get it started. It was just rebuilt and the rings were tight as hell. After a trip around the block, with no helmet, my Dad slowed down in the truck causing the rope to go slack. The rope caught in the wheel and locked it hard. The dude went flying at about 30mph and landed right on his face in the pavement. He had a broken nose and ankle. The guy's face looked like a pizza. I have no idea why we did anything so entirely stupid, but he insisted. I was 15 and will never forget the "oh #$*%" look on his face when he went airborne. I mean ya; a concussion, that's right. Thay's why at 52 I'm starting to forget things and tend to stop in mid-sentence alot. No fortunately not, my ribs took most the force. Guys, I see alot of fixie riders not wearing helmets. Please do so. Glad it was not worse. I would only like to add, please wear a helmet no matter what you are riding. As a kid we never wore helmets and I am amazed that I have only one friend that took a headder and now rides a wheelchair. His parents take care of him (and will the rest of his life). We are all fortunate, and if you ride long enough, you will fall....its only a matter of time. Hope you are back riding soon! I'm fairly certain I would be dead or handicapped now if not for a helmet. Went around a turn too fast on the road coming home from the mountain, hit a patch of fine gravel I didn't see. Both tires slid out sideways and I went down before I even knew what was happening. The side of my helmet probably hit the road with no resistance. I think I was unconscious for a bit and I think somebody was there asking if I was okay when I woke and I think I rode my bike home then. Called my girlfriend a couple hours later saying I think I had an accident my gloves are torn and there's gravel imbedded in my hand. Well the bike faired better than I. The impact into the pothole caused my handle bars to rotate about 5-10 deg down. 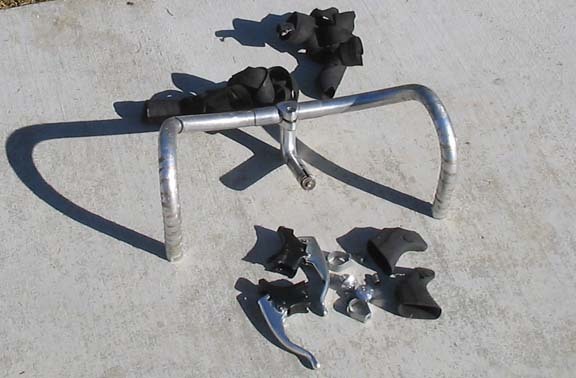 As I went down the handlebars turned right and ground the brake levers (and I just replaced the hoods @ week ago; $32) There was no apparent damage to the front hub or rim, however it was the pichflat from hell. I adding up the damage as we speak. 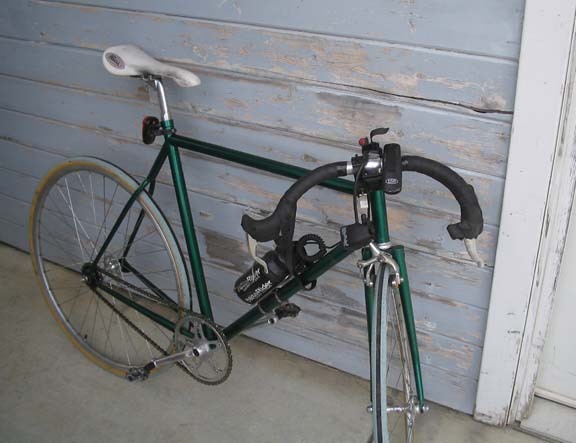 Needed will be new handle bar, brake levers, stem, bar tape and Night Rider light mount. Last edited by aka brad; 02-18-2007 at 06:26 PM. what is that? strawberry? hunter? think i have a spare light mount in the garage, if i find it, its yours. All I know is it was sold through the Bicycle Odyssey in Sausalito about 7-10 years ago. I have sent them photos asking the maker but they have not gotten back to me. If you find the light mount let me know and THANKS!!. It looks like the Big Guy is watching over you. Heal up! Pull your fork, and check both the fork and headtube for anything amiss, no matter how small, even a wrinkle in the paint may indicate something. I don't wanna have to hear of another endo. To be honest I wouldn't trust the inspection to any one but my self. My wife (good love her) has hung the bike on its rack, which is about 7 feet high in the garage. She tells me as soon as I can get it down I can work on it. My first job will be to pull it all apart and use the old magnifying glass (as you read I'm replacing everthing short of the headset, wheel and brake, just to be on the safe side). Cracked stays are not prone to catastrophic failure so I'm primarily concerned with the head tube, fork steerer and dropouts. The fact that the Campy hubs stayed together and rim wasn't bent is very encouraging. The new build will be very different. Salsa stem and handlebars with Cane Creek levers. Here are the parts, which are going to the trash. And now I wait. I spent the day inspecting the bike; no problems. No wrinkles, no cracks and nothing bent; just a very minor wobble that took about 4, 1/4 turns to fix. I also found I already had a light mount for my Rider NiteLight. man, glad to hear you are ok. people have been telling me use a helmet for commuting for years.i never do, i think i might use one tomorrow on the way to school. i've wrecked probably half a dozen times this winter in montana on the ice, safe so far, but maybe the man upstairs is telling me something. your story seems to be hitting home. hope you feel better and get back on your bike soon. 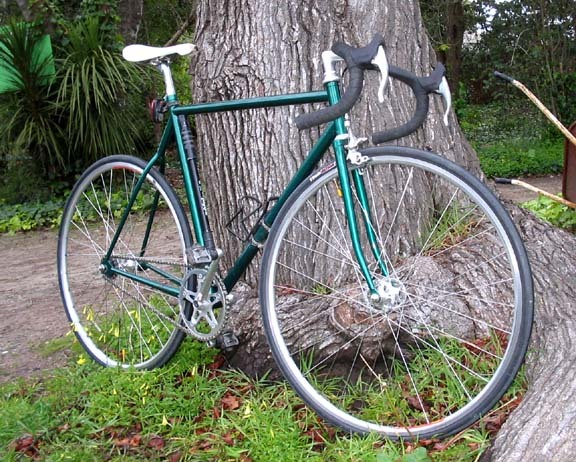 i like the fixie, what kind of frame is that? It is indeed a beautiful frame. I got it from an old neighbor about 5 years ago and he got it in trade for services (he is a Chiorpractor). It has a Bicycle Odyssey stay protector. I checked their web site (http://www.bicycleodyssey.com/) and they are an outlet for a large number of cutom frame builders. I emailed them several times and sent a lot of photos but they have yet to get back to me with an answer. The bike came with a set of Campy track hubs and the Cook Bros Crankset that you see. 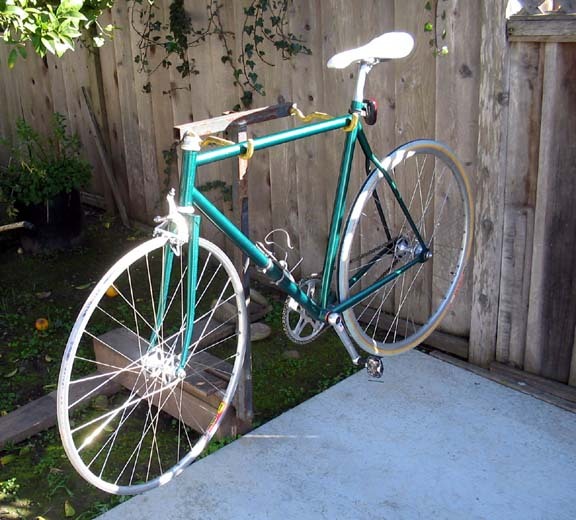 I added the Campy Aero brakes (the rear lever was a dummy) and switched out the sew-up rims with the clinchers. Other than that the Pista handlebars, stem and tape are Cinelli; these unfortunately will have to go. Below is the bike in it's glory days. Also, my helmet that is destined for the trash bin; you can't see it in the photo, but the entire right side is crushed. From one man going through healing from a fall, to another - i wish you all the best Brad and hope you make a speedy recovery. Im sure the rebuild will keep you busy. Im scoping out wheelsets for mine as i totalled my front wheel! BTW, I thought that this time of year they're all out filling in the holes in the road to spend the last of the council budget so they dont get it cut???? that's just rotten luck. Anyway, It's been two weeks since my AC joint separation and im dying to get back on my bike! That said, its going to be another month before I think about it. My helmet didnt come off as badly as yours but its a strange thing just how heavy the head can be. If you pick up a lump of meat at the supermarket you know how heavy a head sized one can be! I remember more that my head hit the floor with a big force than my shoulder hitting. And i was shocked how hard it hit the dirt. Without the helmet, the shoulder ligaments would have been the smaller end of my injuries. ouch, glad you are on the mend. I dig that budget workstand ! Brad - glad that you are mending. I did the same thing (almost) on my fixie about 3 years ago in downtown LA traffic. 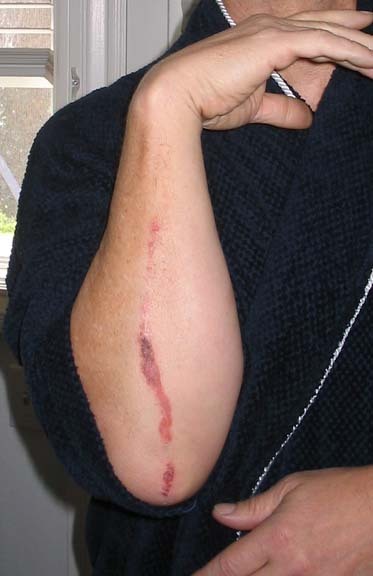 Similar results as yours with 2 cracked ribs, but I also had some nasty damage (boxers fracture + lost flesh) on my knuckles, that took the initial impact. (hands on brake levers straight into the pavement) Looking forward to hearing a first ride back report on the fixie. Brad, how much longer until you come back to work? Looks like you are doing better, although when you picked up your bike from work you looked like you'd been held hostage and beaten. I'm going to drive the hill that claimed you tomorrow and check on the sink hole. I'm gonna call it a sink hole until the city fills it. Turns out my body does not recover from blunt force trauma like it used to. I drove the route today and they haven't done anything about it yet. Giro has saved my bacon too. Yeah, the sink hole is still there. This is very unfortunate and looks ready to claim another victim. At least they could have barricaded it off to give some temporary protection. Well hopefully you heal soon! Last edited by BLS439; 02-24-2007 at 09:26 AM. I drove by yesterday and it was patched.